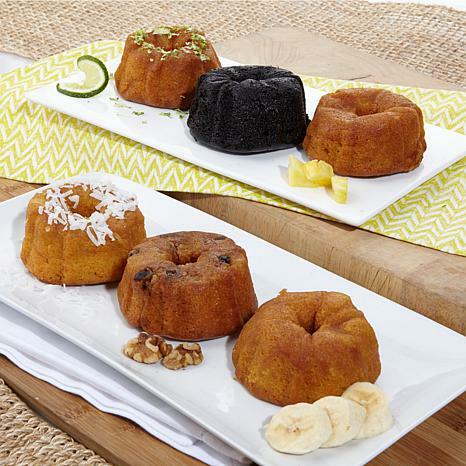 Put some spirit into any celebratory venture with this set of delicious rum cakes. 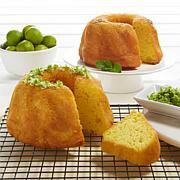 Moist and full of flavor, these famous cakes come in sealed packaging so you can set each one out as an individual dessert, or give the whole set as a delectable gift. So tasteful, how could your guests not be impressed? 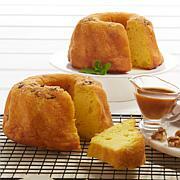 Contains wheat, eggs, soy, milk and walnuts and may contain tree nuts. Ingredients: Sugar, whole eggs, wheat flour, soy and/or corn oil, skim milk powder, egg white powder, modified potato starch, baking powder (baking soda, dicalcium phosphate, aluminum sulfate), salt, propylene glycol, wheat starch, modified corn starch, emulsifiers (mono and diesters of fats, mono & diglycerides, polysorbate 60), gum Arabic, sodium alginate and sodium propionate, butter, Tortuga Gold Rum, xanthan gum, guar gum, natural and artificial flavors, caramel color, yellow 5 and 6. 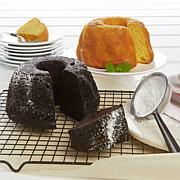 Original cake contains walnuts, natural & artificial flavoring chocolate cake contains dutched cocoa powder, coconut cake contains coconut flakes,natural & artificial flavoring, pineapple cake contains pineapple juice,natural & artificial flavoring, banana cake contains natural & artificial flavoring and key lime contains key lime juice, natural & artificial flavoring. I could not keep these cakes in the house. My barber wanted three cakes and wanted me to order more. Yum Rum. What a great delicious little cake. Boy, are they flavorful, moist, tasty. Absolutely can taste that wonderful Rum. 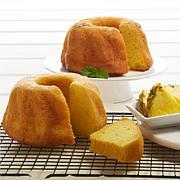 The various flavors of cakes are subtle mixed with Rum. I love the fact that these last up to a year due to it's vaccumed packaging. These are great for teas, treats, deserts, and more. Great Product. Will order again. Great price. Our family absolutely loved these. They taste so good and there's so many flavors. Just such a perfect little treat.